If you’re going to write a book about your religious conversion it’d better be a great yarn. And if you’re going to write a memoir while you’re still in your early thirties you’d better be a great writer. In From Fire, by Water Sohrab Ahmari has both boxes checked. A great yarn, according to my definition, traces the arc of a legitimate journey. In the case of a religious conversion, that journey can be from unbelief—or anti-belief—to belief. It can also be from wrong belief to right belief. But it shouldn’t be a short journey, from, say, a little belief to a little more. A great yarn is the kind of thing that doesn’t happen every day. Ahmari was born Muslim in Iran. Before he took his current job as op-ed editor of the New York Post, he was a writer for Commentary, a neoconservative magazine with a stated interest in “the future of the Jews, Judaism, and Jewish culture in Israel, the United States, and around the world.” That’s the kind of thing that doesn’t happen every day. Not so in the Islamic Republic. Irrationality reigned over the dust and rosewater. Religion teachers railed against Western decadence but watched American blockbuster movies behind closed doors. The morality police were feared but easily bribed—with money, with contraband videos, or with wine. The Shia Islam practiced and professed by most Iranians didn’t comport with the Ahmari family’s “liberal sentimental ecumenism.” The irrationality of Iranian society forced people into a dual existence—one public, one private. Young Sohrab revolted against the duality, ultimately concluding that God didn’t exist and that Islam “was synonymous with law and political dominion without love or mercy.” When he and his mother won their green cards, they hastily decamped for Logan, Utah, a Mormon community about eighty miles north of Salt Lake City. That detail alone has the makings of a good yarn. 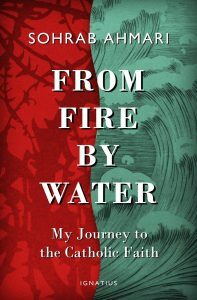 From Fire, by Water is a story of religious awakening, but the political awakening comes first. After graduating from the University of Washington, Ahmari embarks on a post-college tour in Brownsville, Texas, with Teach for America. There he meets Yossi, an Israeli colleague whose personal integrity and refusal to kowtow to the left-wing pieties of the other young idealists in their midst puts Ahmari on a course toward the political right. He’s “utterly in awe” of Yossi’s commitment to doing the right thing all the time no matter how it is interpreted by those peddling the intersectional values of diversity, redistributive justice, and privilege purging. Yossi insists on discipline in his classroom, which is frowned upon by the TFA cadres but which Ahmari secretly believes is necessary. Yossi refuses to “grade generously,” inviting the disapproval of parents and teachers but earning admiration from Ahmari, who sees the results. The kids in Yossi’s classroom excel while the other kids don’t. Ahmari is a voracious and perceptive reader, and his appetite for books and ideas fuel every step of his journey from budding Marxist to postmodern materialist to classical liberal to Catholic convert. This is an intellectual biography, giving readers an inside look at the incremental and steady effect that articles, novels, magazine pieces, paragraphs, sentences, and words, words, words can have on the construction and constant revision of an engaged person’s view of the world. Remember that young Sohrab’s hope in fleeing Iran was to escape irrationality. As an adult he follows where his rational mind leads: from Friedrich Nietzsche to William S. Burroughs, from Albert Camus to Arthur Koestler, from Leo Strauss to Pope Benedict XVI. Each step in his intellectual development leads him ever closer to the most troublesome truth of all—the cross. Ahmari’s rode to Rome runs through New York City, where he catches on as an editorial writer at The Wall Street Journal (we never crossed paths during his tenure), and London, where he is catechized by a priest at the famed Brompton Oratory. The latter chapters detailing Ahmari’s religious conversion are brilliantly rendered and will, as Philadelphia Archbishop Charles Chaput writes in the foreword, “stay with the reader for a very long time.” But before he gets anywhere near the baptism he so desires, Ahmari takes readers on a chapter-length detour to Turkey, where he reports on his attempts to enter Europe alongside refugees during the 2016 migration crisis for a Journal story. He seems to view this trip as a final glimpse at the depths of human darkness before the new dawn of his Christian life but it feels slightly out of place. Like the rest of From Fire, by Water, the Turkey chapter is precise and evocative, but it’s a detour, interrupting momentarily the forward motion of what is otherwise a great yarn. Matthew Hennessey is deputy op-ed editor for The Wall Street Journal.